Review posted August 2, 2018. 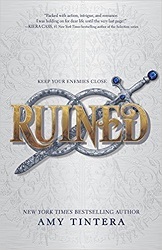 Ruined begins with the main character killing someone, which is fair enough – It’s a violent and bloody book. But the author wins you over anyway. The stakes are obviously high right from the start. Em and two Ruined fighters are attacking the carriage of the princess of Vallos. This princess is the one who killed Em’s father, the King of Ruina, and left his head on a stick for her to find. The princess was traveling to marry the prince of Lera. Lera was responsible for the death of Em’s mother, and they took her sister Olivia captive. Em is going to take the princess’s place and marry Cas, the prince of Lera. The plan is dangerous. If anyone discovers her deception, she will of course be killed. At the start of the book, as Em meets the royal family of Lera, with each person she meets, she thinks about how she could kill them if things go bad. What weapons are handy? How could she use them? The Ruined are feared because they have magic. Anyway, most of them have magic. Em was born without magic and is considered useless. Her powerful sister was to be the next queen. Em hopes that by infiltrating the royal family, she can learn Olivia’s whereabouts, before warriors from Olso attack with the remaining Ruined. Em didn’t expect to find Cas so different from his parents, so willing to listen to reason. She didn’t expect to fall in love with him. This book is full of action and, yes, blood and gore. There’s a violent history on both sides. And not everything goes smoothly in the attack Em had tried to coordinate. By the time I read this book, during my reading Teen Speculative Fiction for the 2016 Cybils, I was getting tired of girls falling in love with a prince-of-a-family-who-oppressed-my-people-but-has-a-heart-of-gold. Really? I did enjoy the book, but wasn't quite comfortable with that aspect of it, even by the end. Unfortunately, this is only Book One. Though the story comes to a decent stopping place, it’s not finished. There will be conflict ahead! Fortunately, this is only Book One. There will be more!